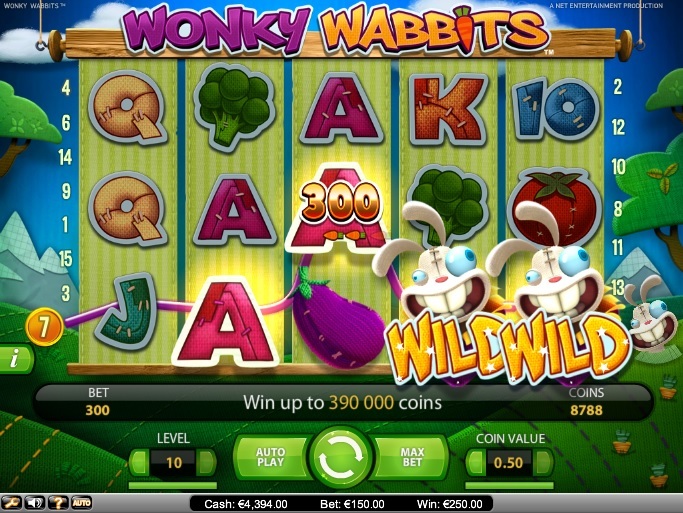 Wonky Wabbits is a non-progressive Net Entertainment (NetEnt) online video slot with limited bonus features. However, the slot gives players the opportunity to win up to 390,000 coins in features such as stacked wilds, wild substitutions, and a lucrative bonus game. The top fixed jackpot is worth 1,500 coins. The 15 paylines in case of Wonky Wabbits are fixed, owing to which players cannot select the number of paylines they would like to play. They have to play all the 15 paylines. They can bet up to 10 coins per payline and select from coin values in the range of $0.01 to $0.50. The betting range of Wonky Wabbits is therefore $0.15 to $150.00, which makes it a great slot for high-stakes players who love the thrill and adventure of betting big on slot games. Like all NetEnt slots, Wonky Wabbits comes with a Skill Stop feature, which players can use to stop the reels in mid spin and grab a winning combination. There is also an Autoplay feature, which players can use to spin the reels automatically when they do want to do so manually. Players can also alter the game settings to suit their tastes and preferences. They can turn off the sound effects and background music, alter the graphics quality, and view the gaming history whenever they like. Wonky Rabbits is based on the humorous theme of rabbits. The slot relates the story of hungry rabbits that enter someone’s kitchen garden in search of something to eat. Set against the backdrop of blue skies, distant mountains, and trees, the reels of this slot feature icons of corn, carrots, tomatoes, broccoli, eggplant, and high-value cards. Wonky Rabbits is a charming slot that features astounding graphics, sound effects, animations, and color scheme. It is definitely capable of keeping players glued to their seats for hours. The Wonky Wabbits Game Logo icon is the wild, which substitutes for all other icons on the reels and helps players complete winning combinations. However, this wild icon isn’t just an ordinary wild. As soon as it appears on the reels, a tiny rabbit also appears, burrowing under the reels and converting other icons also into wilds. Since the wild icon can appear stacked on the second and third reels, as many as 14 wild icons can appear on the reels at a time, translating into huge wins for players. In fact, players can win up to 390,000 coins while spinning the reels of this slot. Initially, players tend to feel disappointed with the absence of bonus features such as scatter payouts, multipliers, free spins, and progressive jackpot. But ultimately, the slot wins over the hearts of players because of its charming rabbit theme, its wild substitution feature, and the opportunity to win up to 390,000 coins.